Bride & Groom; Ashley and Kyle Celebrated their Wedding Day on the Evening of October 27th 2018 at the Old Mill in Toronto, with Family & Friends. A very Warm, Rustic Wedding Reception wrapped in gorgeous Circa 1800 Architecture with Gold as the colour highlighting the space. 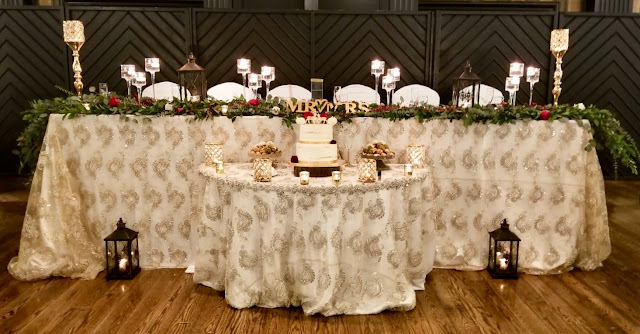 The Stunning Decor included Gatsby Gold Linens, Rustic Lanterns, Gold Stands and Gatsby Candle Holders, and a Beautiful Mirrored Seating Chart giving the Wooden Elements tied in the room. Trade Sensation had the Complete Honour and Pleasure to be apart of Ashley & Kyles Wedding Day; with Wedding Planning and Decor. #ashleyandkyleslovestory on our instagram, @trade_sensation to see more of their beautiful photos! On October 27th 2018, Veronica and Erick Celebrated their Love with a Ceremony and a Reception followed later in the Evening. 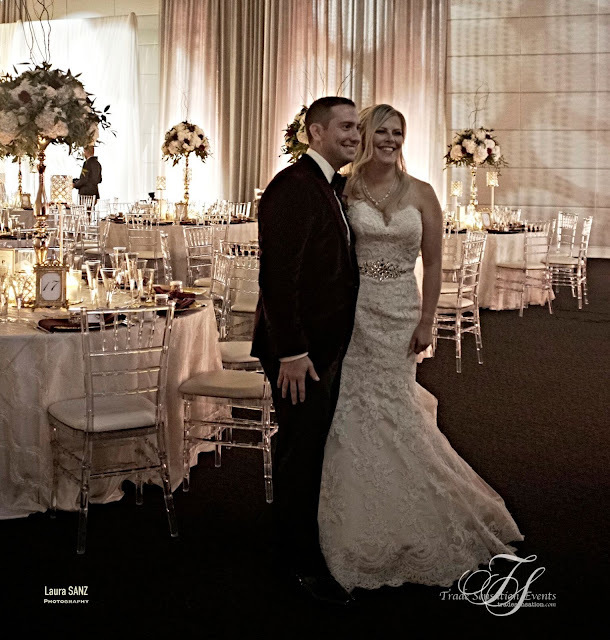 Their Wedding Reception was held at Universal Event Space with Family and Friends. As the Decor was Silver-themed, the Venue itself is grey/silver and everything tied together perfectly. From the Stunning Grand 20ft Backdrop with Sliver Linens to make it POP and a Chandelier. The Head Table with Gorgeous Crystal Candelabras and Clusters of Stem-Glass. With the Cake Table, Head Table and Bridal Party Table Linens all matching. White, Silver and Grey was the colour palate for this Wedding Decor. White Mirrored Seating Charts, Sign-in Book Table, Memory Table and Receiving Table in Lobby/Cocktail Area. Thank you for having Trade Sensation be apart of your Special Day! October 20th 2018, a day filled with so much love, celebration and happiness; Amanda and Alex celebrated their love on their Wedding Day. Their Ceremony was held in the early afternoon at the St. Ambrose Catholic Church, while their Wedding Reception was held in the early evening at The Grand Luxe Event Boutique with Family & Friends! Such a Stunning Venue in itself, the Wedding Reception Decor tied everything together for a Spectacular Wedding! 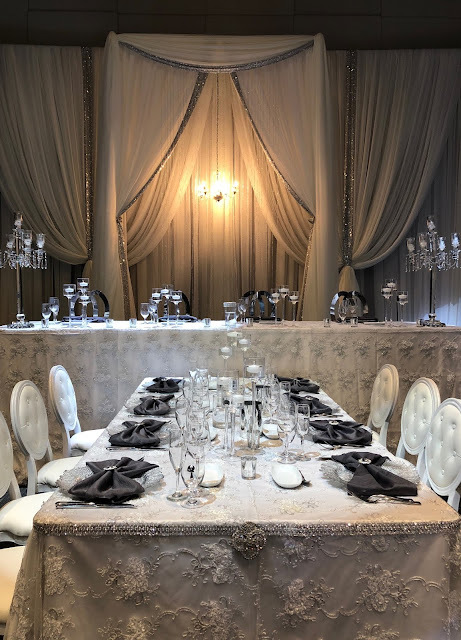 Alex and Amanda's Head Table featured Floating Stem Glass Candles, with Gold Votives, Bridal Party Tables with Stunning Gold & Crystal Candelabras and Gold Gatsby Overlays. Guest Tables with beautiful Gold Stands with Florals as the Centrepieces. Beautiful Gold Mirrored Seating Charts for Guests to find their seats and a Glass Money Box in the Lobby. The Trade Sensation Team had the Complete Honour and Pleasure of being apart of the Planning and Decor for their special day!